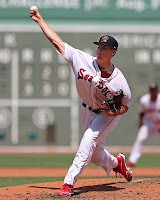 The Red Sox have promoted right-handed pitcher Keith Couch from Double-A Portland to Triple-A Pawtucket. Couch will make his PawSox debut tonight against the Buffalo Bisons. Couch, a 13th-round pick in the 2010 draft, has risen steadily through the Red Sox system. After receiving recognition by the SoxProspects community as an All-Star in both the 2011 and 2012 season, Couch reached Portland to begin 2013. The 23-year-old began the season in the bullpen, and the transition proved difficult, as Couch carried a 4.78 ERA and 1.619 WHIP through 14 relief appearances. He moved into his more familiar role as a starter on June 9, and the results have been more in line with his previous performance. In 11 starts, Couch was 5-1 with a 3.41 ERA and 1.342 WHIP. Despite spending the first two months of the season in relief, Couch ranks tied for third in the organization in wins with 8, and eleventh in innings with 100 2/3. It is the first in-season promotion of Couch's career. Across four levels since 2010, the righty has made 95 appearances, winning 27 games with a 3.72 ERA. He will take the mound tonight at 7:00 at Coca-Cola Field in Buffalo against veteran left-hander Ricky Romero.